Another fantastic new Peachy Keen stamp release is here! If you arrived here from Viv's site, you are on the right track. If not, please start at the beginning of the hop HERE. My assigned set is Cute & Cuddly (PK-440 & PK-441). 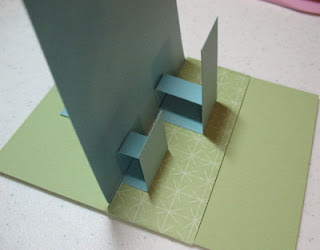 The instructions for creating this sliding pop up card is below the blog hop list. Want a chance to win some stamps? Be sure to leave a comment here and on the other hops along the way. Please note that I will be out of town with no internet access during this hop. I have temporarily set my comments to unmoderated with word verification. Click here to visit Lorie's awesome blog. If you got lost in the hop, here is the list of hoppers. 2) Clip off top of ornament and cut off bottom of 2 medium ovals. Sponge the edges tan colored pieces with cocoa ink. Sponge the edges of pink pieces with regal rose ink. Stamp the Cute & Cuddly face with black Staz On ink. Add white to eyes with unibal white gel pen. Add blush to cheeks with stipple brush and rose ink. Color nose with rose ink and blender pen. 3) Glue ears to head. Attach legs to back of body with dimensionals. Attach feet to legs with dimensionals. Attach paws to front of body with dimensionals. Attach head with dimensionals. Attach tail onto back of body with dimensionals. 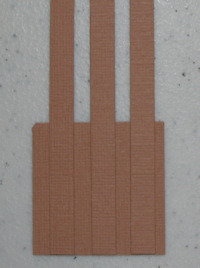 4) For the basket, cut 3 strips of creamy caramel card stock 1/4" x 6". Punch or cut one square 1 3/8" x 1 3/8". 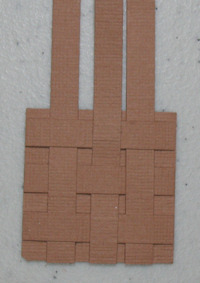 Use mini glue dots to attach each end of 1/4" strips on the square (make sure to not adhere the strips in the middle. Clip off the excess strip pieces from the square. Turn the square 90 degrees and adhere 3 more strips. For the first strip, slide the strip under the first strip on the square then over the middle and under the 3rd strip. For the next strip, start at the top then under the middle strip and on top of the third. For the last strip, weave it on like the first. Clip off excess strip pieces. The finished square should look like a woven basket. Corner round punch the 2 bottom corners. Take excess strip pieces and cut to 2 3/4" length. Fold in half and round out the unfolded ends to form a basket handle. Make 2 of these. Sponge the edges of basket and handle with cocoa ink. 5) Punch out 5 wide hearts from Heart to Heart in assorted colors. I used the new Glitter paper available from Peachy Keen Stamps. Cut the hearts in half. 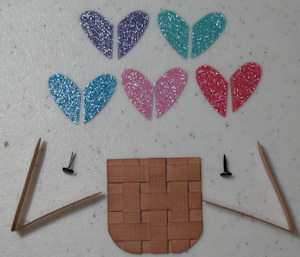 Use glue dots to attach 5 of the heart halves onto the back of the basket. Slip a handle onto each side of the basket. Pierce a hole through the handle and basket. Attach a mini black brad. Attach the other handle. 6) Die cut 2 strips of light green glitter paper and 2 strips dark moss glitter paper (Peachy Keen) using the grass Dienamics die from My Favorite Things. Round out the ends of the other 5 heart halves to create eggs. Die cut clouds in Shimmery White card stock using Dienamics die from My Favorite Things. Pop Up Back - 4" x 5 3/8" Baja Breeze scored at 1 1/2"
Pop Up Back for Bunny - 1" x 3" Baja Breeze scored at 1"
Pop Up Back for Basket - 1" x 1 1/2" Baja Breeze scored at 1/2"
2) For assembly of the card, follow the basic instructions for the sliding pop up card HERE. If you are more of a visual learner, you can view the video HERE. When you get to step 4, place the pop up back for bunny on the right and pop up back for basket on the left. The pop up bunny piece will be 1/2" in front of the pop up basket piece as shown in the picture below. 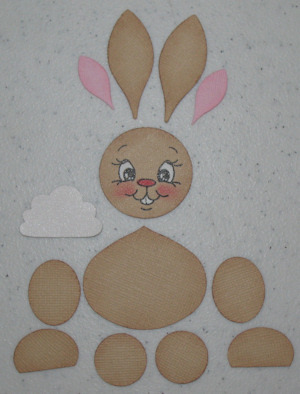 3) Once the pop up card is constructed, you can add the embellishments and piecings. Glue grass pieces along back. Cut to fit around the pop up mechanisms. Attach basket to left pop up backing. Attach darker green grass to front of basket. 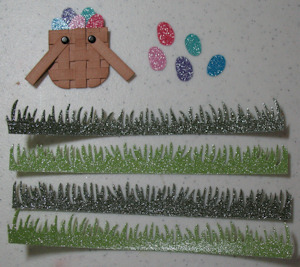 Place 2 eggs onto front of grass and attach another strip of lighter green grass over the top. Attach a strip of darker grass onto right pop up backing. Attach bunny and then attach a piece of light green grass. Add eggs and then another piece of light green grass. 4) Punch the Round Tab punch for the pull tab. Attach to celery card base. Stamp greeting on celery base were it will show when the card is slid open. So adorable. I just love it. Adorable card!! Great instructions!! ThAnks.for.sharing! This is so darn cute, great job! Love the card. Thanks for the instructions. Kim your card is so adorable! Great tutorial too! Great instructions. I love your projects especially the Cadbury egg project. My favorite is the hard shelled little eggs. All the grocery stores around here are out of them. This is so stinking cute!!!! Thanks for the GREAT tutorial too! Adorable!!! Wow, I love the bunny!! Just adorable, Kim! Thank you so much for the wonderful tutorial. I really want to try this!! Your paper punched cuties are always a favorite, and this one is off the charts cute!! Your are awesome.. you amazed me with every punch..
Love youre card and the new stamp .. super cute.. Wonderful! Thank you so much for the tutorial. WOW, so so cute, so talented to put all that together. Love that cute face. Adorable. Absolutely adorable! Looks like a lot of work went into making this display, but the final results is worth it, thank you for the tutorial. So very adorable!!! You're amazing, I can't believe the many different ways you have of playing with punches! Thank you soooo much for the super detailed post!!! BEAUTIFUL card!!! wow this is gorgeous... and oh my... that basket is unreal! Oh my gosh, how adorable. Thanks for the instructions. This blog hop is so enjoyable. Such a fabulous card here Kim!! I just LOVE it. Cute, clever, engineered to perfection! LOVE it! How stinkin' cute! Great job! Thanks for the instructions! Wow what a card . Love it. Too stinking cute and creative! Awesome work. 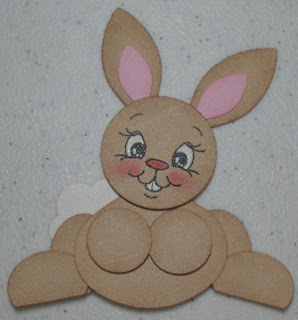 Cutest bunny I've seen this year Thanks for the instructions on making this card.Soo cute! Very cute and thanks for the instructions. Wow-what a great card-thanks for adding the directions! Adorable!! Thank you for sharing the full instructions on how to make this card. Your card is absolutely cute and cuddly! Thank you for the tutorial. love love the card and the detailed instructions (thanks) love your site! I love your popup card - that bunny is so cute!!! Oh my stars this is amazing. Just awesome. Awesome job, I love the card. TFS. What a wonderful card! TFS! Using the heart to make eggs is very clever. Love the bunny!! AWWWW!!!!! Soooo cute!!! Love the way you made the basket!!! Very creative!!! This is SUCH a CUTE card!!! I'm gonna have to attemt my own version! Your card is absolutely adorable! Just love it! So stinkin' ADORABLE!!! Thanks for the great directions!!! WOW, what a fabulous job, love the bunny!! I don't know if my earlier comment will post because I'm having computer issues (right in the middle of trying to do this hop.) Your cards are always so fun & imaginative. This bunny is fantastic! This is too cute for words. You are so clever with those punches. And your bunny rabbit's PK face makes him even more adorable. This is so adorable. I love your card and that face is so adorable. OMG! You flippin AMAZE me! Ilove how you create with punches and come up with this! It always floors me! This is just incredible! i love everything! I love that pop us card with the cute bunny. I think I will try that soon. Wow what a beautiful card and I just love your instructions ...tks for sharing your creation! On to the next blog! Amazing how you work with punches and how beautiful your cards turn out. Thank you for sharing in the hop. WOW, what a goregous pop up card...thanks for the great turtorial!!! I love your card it's soo cute. Such a great idea with the basket. So adorable; I am in aw of your creativity! OMG!! I love it. That little rabbit looks so cuddly! Thanks for the step by step instructions!! Your card is amazing! I love all the detail you put into it! Thank you for sharing your talent! Everything you make is AMAZING!!!!!!! I LOVE this card! Adorable card! Thanks for the tutorial on how to make it too. Adorable bunny!! Thanks for giving the directions to making this awesome card! As always, I love your punch art, creativity & tutorials. Thanks for sharing. Great card. so cute. The bunny is adorable. Awesome card,thanks for the tut! so beautiful thans for the instruction!! Kim I just love to see what you come up with everytime. You have such wonderful tutorials...you make it look so easy because of your talent. Everything you do is GORGEOUS! This is just adorable!! I have never made this type of card so thanks for the instructions. I love this card - the bunny is so cute and the basket is great! Thank you for the wonderful tutorial! So cute, I just bought another face stamp set thats how I found out about the hop lol. I love the weaving on the basket such a good idea! is amazing. Thanks so much for sharing it with us. Your card is adorable! I love everything about it! Especially the glittered grass and eggs! adorable!! I love this set!!! thanks for all the details on how to put one together! so cute. love the basket one! Such a cute card. Have loved your blog for different ideas. Thanks so much for sharing!! I love all of your punch art cards/projects!! I love this bunny, too! And, I'd love to win stamps. Please include me in your drawing. Absolutely adorable!!! I love all the details. Thanks for sharing the instructions on how to make it. And thanks for the chance to win. Wow!! That is sooo cute! TFS! Oh my goodness...so ADORABLE...love everything about this card! That basket is perfect! This is ADORABLE!! Wonderful job! Your Punch Bunny is ADORABLE!! I've become a new follower because your work is truely inspirational. This card is adorable and you have really put a lot of effort in making it and the tutorial. Thanks so much for sharing. I love this card! I awarded you the Versatile Blog Award. Be sure to go to my Blog to grab your award and the rules for it:) Congratulations! I cannot believe those cards are from punches. I love that bunny, how cute he is. Your instructions are really great, thank you for that. You are actually amazing. I am glad to be on the hop because I found you. 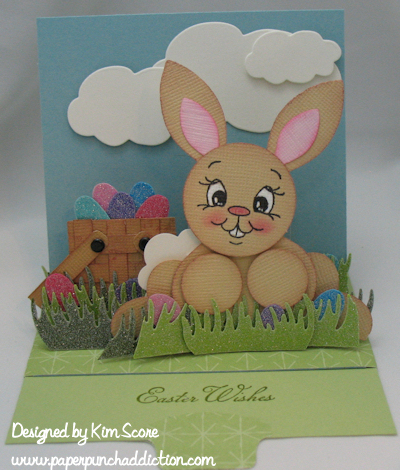 you rock again Kim, sssooo love this bunny!! Love the pop up!! I'm going to have to give that a try!! What an amazing card. That bunny is so super cute. Love the basket and the little eggs too;) Thanks for sharing such an amazing inspspriational card. Thanks for a chance to win ..Love your blog and your cards are adorable. So adorable and thanks so much for all the instructions! Loved the weaved basket. That rabbit face is beyond cute! Very creative! Thanks for sharing tutorial. I've always love paper piecing...loved your instructions on how to make everything...so complete. Thank you for sharing! Absolutely adorable! Wonderful instructions on how you made your card - super cute! 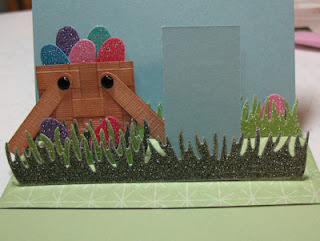 What a wonderful card...the bunny is the cutest and those glittered eggs are fab! Thanks for your instructions!! Love the bunny! Can't wait to try to make some for my granddaughters. Your bunny is HOPPIN! You do the best punch art. I love this card is it a total WOW! Love your use of punches! Cute bunny!! oh my gosh, this is just sooo cute, I just love your pop up cards, TFS!!!!! Great job Kim = you always amaze me. Just adorable. Thanks for sharing and a chance to win. Such an adorable little bunny! Love it! so cute! what a sweet bunny! Hi Kim, Your little bunny is darling. I really love how you created that basket! It's adorable!! Love how you used the PKS stamps!!! Super cute card! Love the bunny!!! Beautiful card- very cheerful and sweet. tfs. 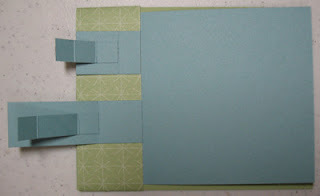 I am so glad I found you blog...you have some wonderful ideas and I love your blog hop card! Thanks so much for this great tutorial for Easter and for all the wonderful tutorials that you share. I made Raggedy Ann & Andy for my grandchildren for Valentine's Day. Now they'll get pop-up bunnies for Easter. What a lovely card and thank you for the tutorial. I love it all. Just love it all! I have found after making cards for 10+ years that I have enjoyed 3-D projects even more! Love your site. I have a blog now bot am having a challenge putting you on it. Love the sliding pop up. So cute. Thanks so much for the wonderful tutorial.